In the past when I would work different 9-to-5 jobs I had a number of job responsibilities. Some of these responsibilities were not exactly what they listed in the job description, but nevertheless, they were a part of my job. I always found it ironic that you needed work experience to be considered for future jobs at other companies, but they would always use your previous work experience as a measure of whether or not you can do the work required for the job you interview for. The weird thing about it is most of my resumes would describe previous work, but I could never really make what I did in the past sound irresistible. A portfolio is not only a chance for you to talk about the previous work you’ve done but it’s an opportunity to finally take control and display the type of work you want to do in the future. I had the wrong mentality. I thought the more experience, the better which led me to put all the types of work that I’ve done to show my versatility. I have come to learn that curation is way better for getting the type of work that you want. Along my journey of learning different creative skills, I learned video editing, audio editing, web design, photography and how to work with Photoshop. I remember editing photos for a client and making graduation invitations which I included in my portfolio. I was later met with an influx of requests to edit photos and create graduation invitations. These clients were nice, but they were never willing to pay over a certain amount. At the time I was in aspiring web designer, looking for any creative opportunity to bring in extra income. I quickly recognized editing photos and creating invitations wasn’t the type of income I wanted to move towards. A second look at my portfolio allowed me to recognize if I wanted a particular kind of client I couldn’t put everything I did in my portfolio. The wise thing for me to do is if I wanted to get into web design then and I wanted future web design clients it was best for me to put in my portfolio web design results I’ve produced for clients. What happens if you haven’t worked with a client in an area of work you want to move toward? The best thing you can do in this case is to make one of your side projects the type of work that you want to produce. If I am a designer who wants to get into logo and branding design, I don’t have to wait for a client ask me to create a logo. I can create hypothetical companies and see what it would be like to make a logo. I can document the process of making the logo, my thoughts, my logic, my sketches and compile all of that in a portfolio. I can even go as far as re-designing iconic logos of familiar brands. Perhaps your reimagining of logos will prove to potential clients that you have the skills to make logos even if you haven’t had many clients in that area. 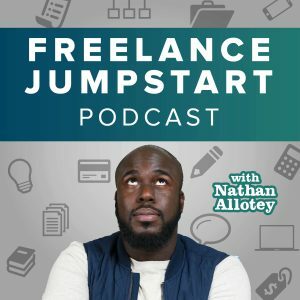 In a previous episode, I talked about speaking up for you at work, the fact that whatever you put in a portfolio or release publicly should have some commentary and explanation attached to it. Speak up for your work in your portfolio, but you do so by creating a case study or a use case for the work you produce. For the case study go into detail about the background of why you created what you did, your design decisions and how the finished product would be useful or is useful to someone. Explain how it can help them better their brand, company, product or service. In the next episode, we are going to get into the specifics of what needs to go in an effective case study. Remember at the least your portfolio is your opportunity to take control, curate the type of work you’ve done in the past and make sure it matches the work you want to do in the future. Every time you create add something to your portfolio, the case study should be so detailed that it could be a blog post which will serve as a marketing tool to be used to get future clients.